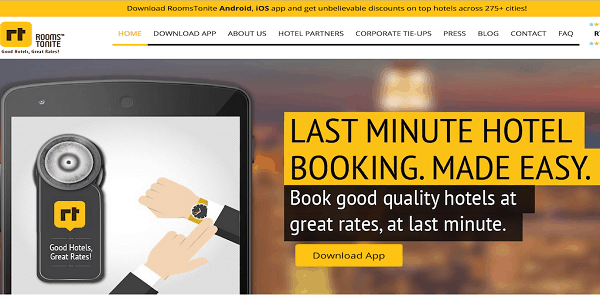 How RoomsTonite is changing the on-demand hotel scenario in the country through its last minute booking option? RoomsTonite is a hotel booking mobile app that caters consumers with good ranked hotel rooms at competitive prices at the last minute. The startup claims that it has real-time connectivity with over 4000 hotels across 325+ destinations in India. The direct connectivity with hotels ensures that their users get guaranteed room booking on the same day or for the next day. This Bengaluru-based startup seems to be one player that has understood the emerging trends pretty well and is betting big on rising smartphone dependability behavior. With more and more people using smartphones as their preferred choice to do things on-the-go, RoomsTonite is changing the on-demand hotel scenario in the country. They have witnessed good traction with more hotels signing up, repeat customers and the booking window shrinking. Why we chose RoomsTonite as Startup of the Week? Available across mobile platforms like android, iOS, Windows and BlackBerry. Hotels go through a strict quality check process with various parameters such as the hotel’s review rating, actual reviews and management response. Currently, the platform contains 4000 hotels in the price range of Rs 1,500 to Rs 10,500 per night. RoomsTonite has 4,000+ handpicked hotels across 325+ destinations in India. For business and corporate travellers, RoomsTonite offers multiple benefits including huge savings (about 25% on average) on the hotel stay expense, and gives flexibility of booking a hotel only when needed, and giving the employees a wide and better choice of curated hotels to stay with (at the current or cheaper cost). 24×7 travel companion service to help travellers with enquiries and specific needs at all the stages of travel. Many value added services are offered to the customers like – informing the hotel about any unexpected flight delay to purchasing movie tickets, sending couriers, locating the nearest restaurants and entertainment to booking a taxi. RoomsTonite has seen around 2, 00,000 downloads so far within a year. Currently offering hotels at over 425 destinations in India, the app will soon offer options in Kathmandu and Colombo. Over 11,000 Facebook fan followers grabbed organically within a year. Suresh John, the CEO of RoomsTonite has been in the hospitality technology industry for the past 25 years. He has launched two successful hospitality technology companies – IDSNext and RezNext. He saw a huge gap between the demand and supply of hotels in India, especially when it comes to last minute travel. For the past five years in India, the average occupancy rate across hotels in India was only 60%. With the spending power increasing among Indians, more and more people looking for short breaks, and mobile adoption is skyrocketing, John observed a clear opportunity to merge the gap between people who are looking for last minute hotel stays and hotels wanting to sell their unsold rooms at the last minute. [su_box title=”More Startup of the Week From DSIM” box_color=”#c7c7c7″ title_color=”#000000″ radius=”5″]1) How a visit to Pune led the foundation of StreetBazaar, a portal for quality non-branded products? The company is leveraging Facebook and other ad networks for growing RoomsTonite and carrying it over to the next level. It has started the content-focused initiatives to increase brand awareness. Hotels are free to tie-up with the platform. With just sending a request to the company, hotels can get their rooms listed on the platform at no cost. RoomsTonite runs a verification process and if they meet the criteria then the hotel rooms are listed over the platform. RoomsTonite charges a commission of about 15-18 percent on every booking done on the app. Most recently in December last year, RoomsTonite had raised $1.5 million in seed funding from a bunch of angel investors including Lashit Sanghvi, co-founder of Alchemy Capital; Nikhil Vora, founder of Sixth Sense Ventures; Venkat Vardhan, promoter of DNA Networks; Mohammed Bin Abdul Rehman Al Khalifa, chairman of Caravan Group; and Ralph Berezan of Berezan Group of Canada. RoomsTonite wants to provide a better payment experience in the future and the team is in talks with digital wallet companies about possible integrations. They also wish to categorize the hotels listed on their platform in a more efficient manner and provide information about hotels near the user, using their GPS location. Currently available in top cities like Bangalore, Mumbai, Delhi, Chennai, Goa, Hyderabad, Ahmedabad, Kochi, Jaipur, Pune, Gurgaon, Mysore, Vijayawada, Noida and Kolkata, RoomsTonite is planning to expand its footprint to more cities as well as looking for global expansion.